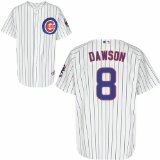 The Chicago Cubs will honor the latest inductee to the Baseball Hall of Fame, former Cub Andre Dawson before Monday’s (8/30/2010) game against the Pirates. Chicago Mayor Richard M. Daley will declare Monday “Andre Dawson Day” in the city, despite his status of being a devoted Sox fan. The Cubs will present a ‘gift’ the the Hawk as part of the ceremony. The first 10,000 fans at Wrigley Field that night will receive a commemorative Andre Dawson hat (compliments of The PrivateBank). Tom Skilling‘s weather prediction shows a sunny day, high of 89 degrees and gusty winds blowing straight out 11-23mph – sounds like a beautiful evening for baseball and perfect to honor The Hawk! Cubs management says: Fans should prepare to be in their seats before 6:40pm in order to watch the pregame ceremony.